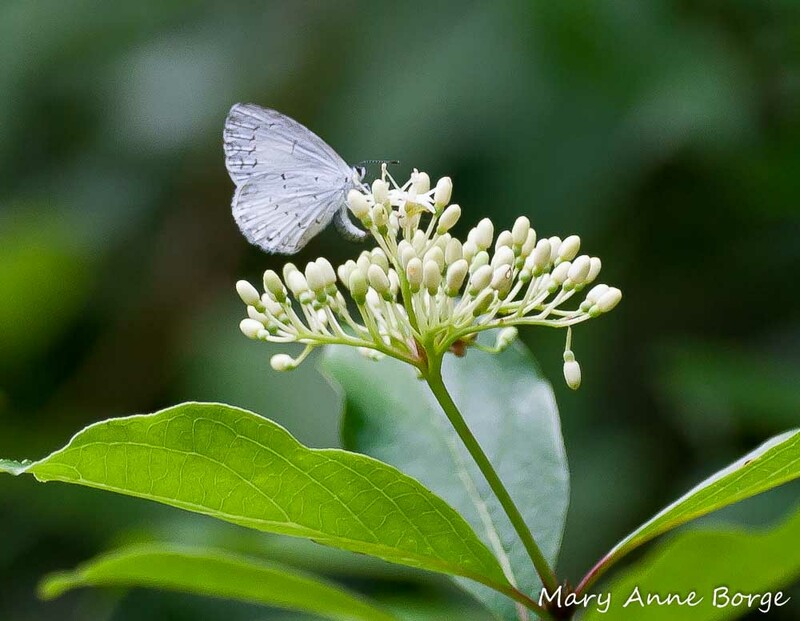 This Spring Azure butterfly is laying her eggs on the flower buds of a Gray Dogwood (Cornus racemosa), taking advantage of the nourishment this shrub provides her offspring. Dogwoods are among the favored plants of this butterfly’s caterpillars, helping to ensure that you’ll continue to see the sprightly Azure on a regular basis. 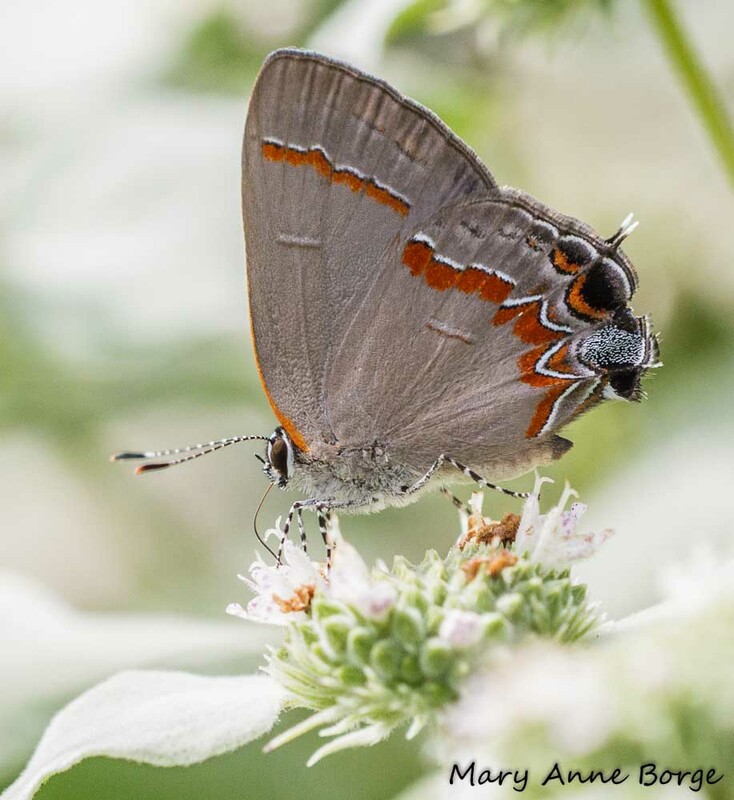 Nearby, a Red-banded Hairstreak drank the nectar offered by the profusion of lovely flowers. 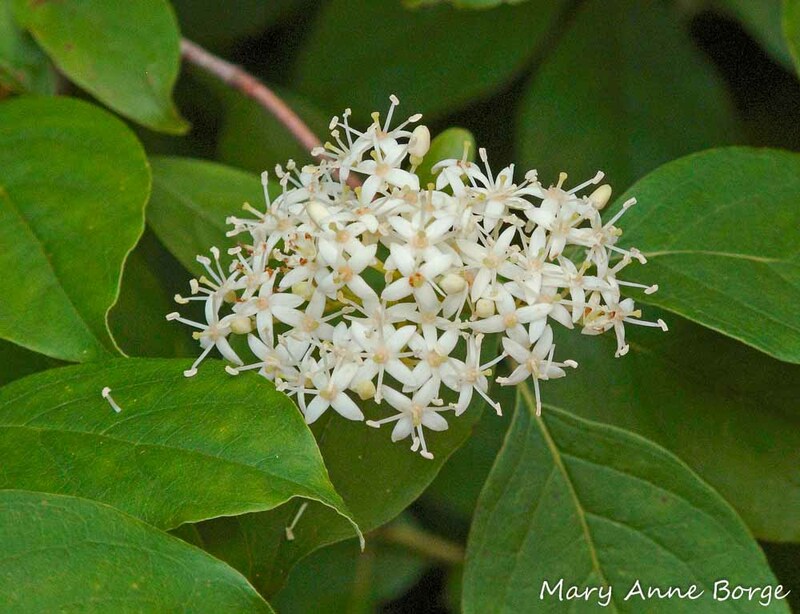 Blooming for a period of a few weeks in late May to mid June, Gray Dogwood is a relative of the more familiar Flowering Dogwood (Cornus florida), but Gray Dogwood is a shrub, growing to a maximum height of 12-15 feet (about 3.5-4.5 meters). The flowers and leaves of Gray Dogwood show typical characteristics of this family of plants. Each delicate flower has four petals, arranged symmetrically in a cross shape. The leaves are opposite each other along the branches, with arched veins curving toward the tip of the leaf on both sides of the midrib. The common name, Gray Dogwood, refers to the color of the bark, which is usually a light gray. The species name, racemosa, describes the half-sphere arrangement of the creamy white flower clusters. The flowers’ nectar attracts an array of busy pollinators, including bees, beetles and butterflies. Even better, Gray Dogwood provides the female Azure butterfly a place to lay her eggs. Several moth species use the dogwoods as food plants for their caterpillars, including the beautiful Polyphemus Moth. Birds that like to nest in the shrub layer look favorably on Gray Dogwood when they’re shopping for real estate. Northern Cardinals, Goldfinches, Catbirds and Yellow Warblers are some of the birds that covet the features offered by Gray Dogwood. The multi-stemmed shrub with its sturdy branches offers a safe nesting place, with food right on the premises. During nesting season, the pollinators and any caterpillar progeny offer the protein necessary to raise healthy young birds. 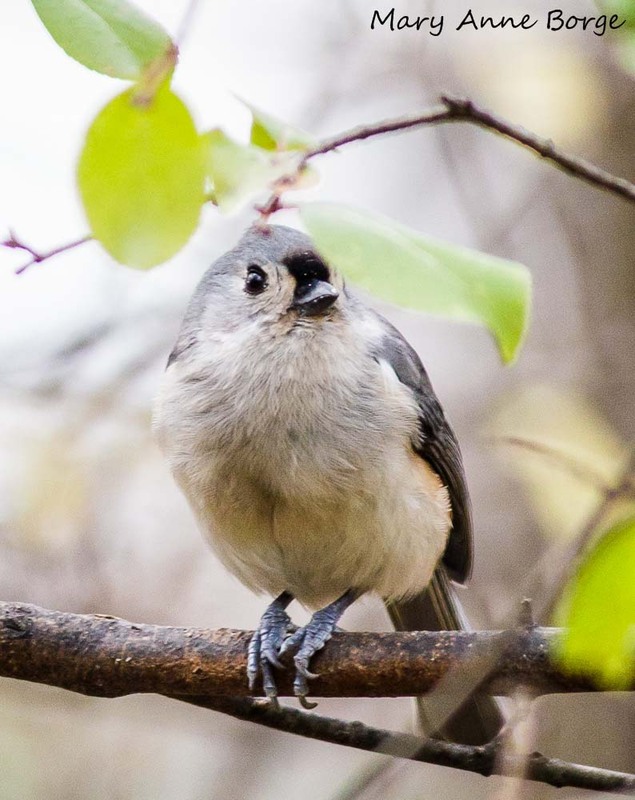 Newly fledged Chickadees and Titmice may also browse Gray Dogwood for a quick bite, or take refuge in its sturdy branches. Flowers that are successfully pollinated by butterflies, bees or other insects will produce a round white berry-like fruit called a drupe. The fruit appears on a platform of bright red stems, called pedicels, beckoning the local bird population to stop for a meal. 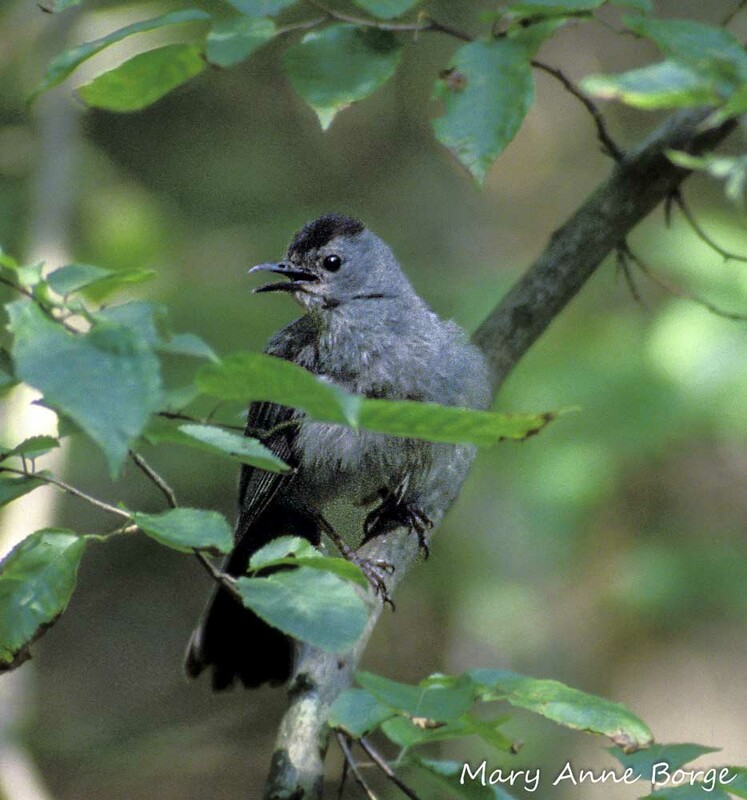 Birds find the fruit irresistibly delectable, eating it as soon as it ripens in late summer for a jolt of energy. Squirrels, chipmunks and other mammals also enjoy the tasty bounty. For your viewing pleasure, the red fruit platforms remain for weeks even after the fruit is snapped up by resident and migrating birds. As fall approaches, Gray Dogwood’s leaves turn from deep green to a regal reddish-purple. 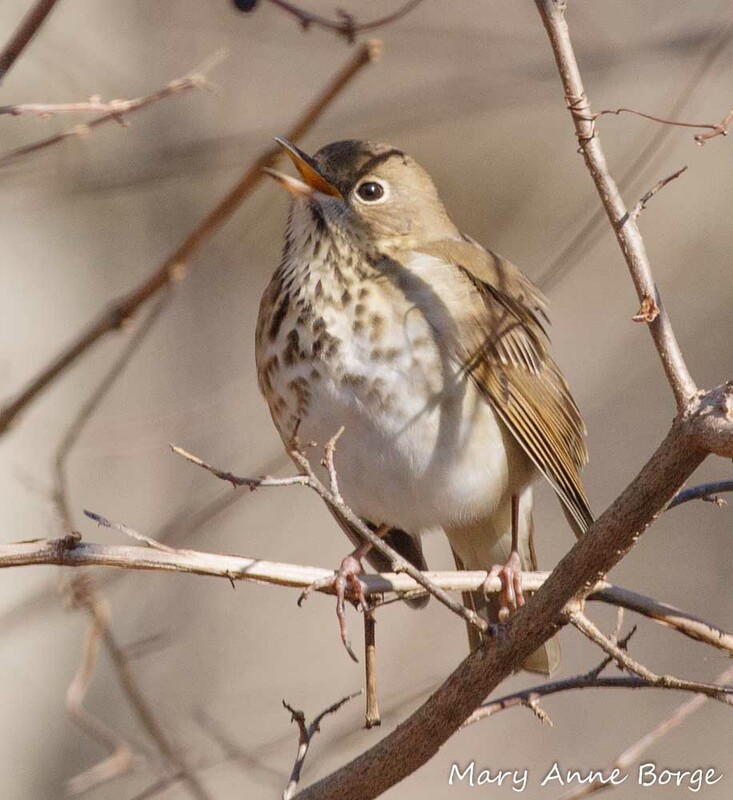 In winter, its branches shelter the birds that live with us year-round. Gray Dogwood is native in the Canadian provinces of Manitoba, Ontario and Quebec, as far south in the United States as South Carolina, Kentucky, Arkansas, Nebraska, and Texas. It adapts well in many conditions. It prefers moist, well-drained soil, but can tolerate poor, compacted soils, and drought conditions. It likes sun, but it can also do well in part shade. It’s often found in woodland openings or open fields. In landscaping, Gray Dogwood can be used alone in any location where a good-sized shrub is needed. Or even better, mixed with other species it brings visual and animal diversity to your property. Gray Dogwood combines well with Ninebark (Physocarpus opulifolius), American Hazelnut (Corylus americana), or Blackhaw Viburnum (Viburnum prunifolium), among others. Gray Dogwood with Syrphid Fly, a Bumble Bee mimic. 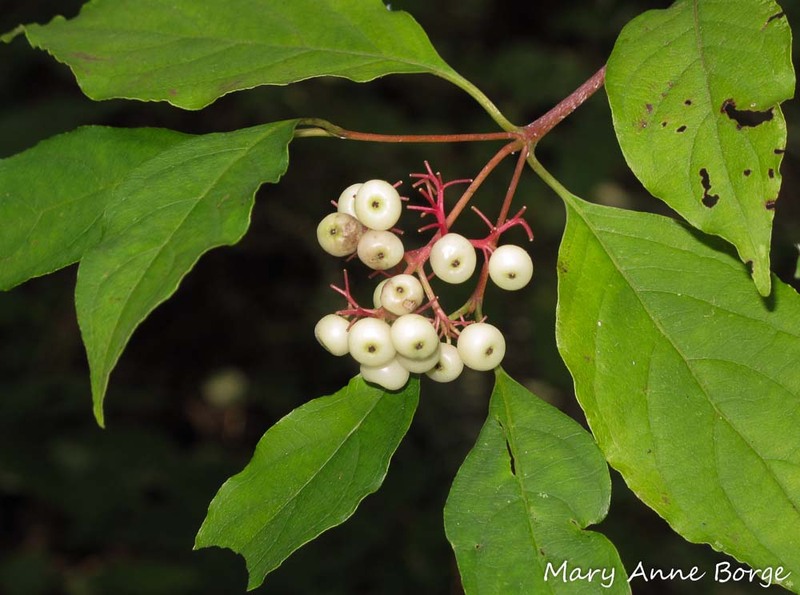 Gray Dogwood is great for birds, butterflies, bees, and many other critters – even people! 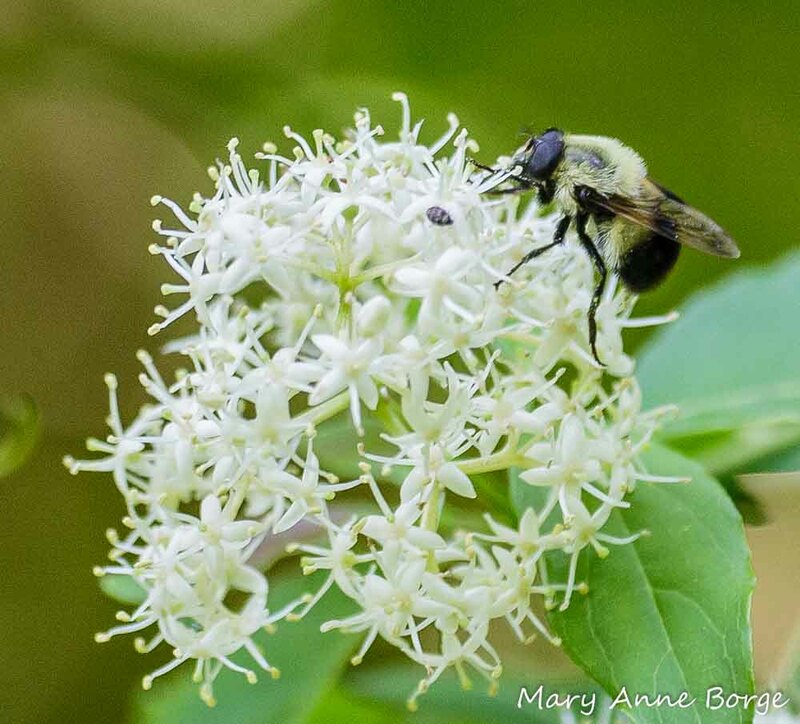 This entry was posted in Birds, Butterflies, Gardening for Wildlife, Native Plants, Other Insects and Spiders and tagged Cornus racemosa, Gray Dogwood, nature by Mary Anne Borge. Bookmark the permalink. Nice blog! The Gray Dogwood and Bumble Bee image isn’t correct! The bee is not a bee, but rather a mimic. It is a syrphid fly also called a Hoverfly. The short antenna is the easy give away. Good catch! The eyes are bigger and closer together than a Bumble Bee, too. I’ve made the correction. Thank you! Wonderful entry on your superb blog!! Thank you!! Wonderful photos of butterflies, birds and bees in an ideal habitat. I particularly love the photos of the birds with open beaks and a light in their eye, presumably singing. A new perspective is always appreciated! Beautiful pictures. As usual, I learned a great deal about another native – the gray dogwood! Thanks! We’re in the middle of flowering shrub season. Lots more beauty in the weeks ahead! Wonderful, as always. I love your personal voice and images to go with your articles.